But, perhaps, the biggest mystery of all has been the curious existence of a UK-based Alsbridge firm, which has long been widely-rumored not to be actually owned by its much larger US namesake. However, all this mystery finally unravelled itself recently when the Alsbridge mothership announced it was building its own organic European empire, and the company formerly known as "Alsbridge Europe" was spinning off on its own direction - and attempting to move further up the alphabet - sporting the name "Aecus". Phil Fersht (CEO, HfS Research): Chip - firstly, it's great to have you on HfS - I believe this is the first time since you were appointed CEO. 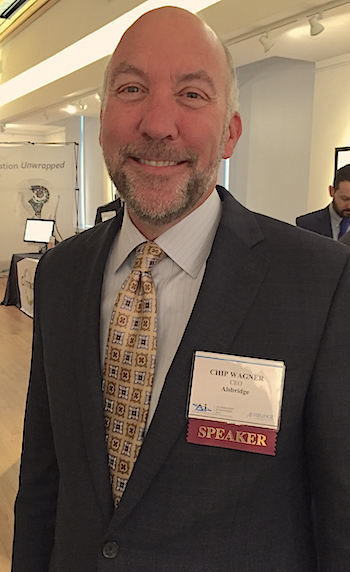 Chip Wagner (CEO, Alsbridge): It is, Phil, and thanks for the invitation. Glad to be on HfS! Phil: Chip, can you give us a quick download on what's been happening with the firm since the investment made by LLR? Chip: We have thoroughly enjoyed the two years since LLR invested in Alsbridge; they have been a fantastic owner and advisor. Shortly after the LLR investment, Alsbridge’s founder, Ben Trowbridge, left his CEO position in July 2013 and then moved on from the Board in July 2014. After assuming the CEO role and later a position on the Board, I’ve been working with the team to push a number of initiatives that include changing our corporate culture, restructuring the organization, establishing a delivery center in India, launching a new service line to deliver ongoing vendor management, opening new offices in Canada and Germany, and expanding our UK presence. We’ve been busy and so far we’ve had great success experiencing 32% organic revenue growth, increasing EBITDA margin and hiring a group of all-stars to carry us forward into 2015. Phil: So what's different about Alsbridge these days? Chip: As part of a rebranding initiative, we have embraced a new Alsbridge tagline of “Challenge the Future” for both our external clients and internal operations. We believe that smart businesses challenge everything - especially conventional thought, existing behaviors and perceived best practices. From an internal perspective, we have managed to unlock potential in our team, strengthen accountability, introduce a much more transparent culture, and empower the talented people we have working for us. From an external perspective, we are evolving our service offerings, methodologies, tools and capabilities to advise clients on business and technology transformations that were unheard of just a few years ago. For example, we just helped a Fortune 100 retailer with over 5,000 locations cut their network spend by over 25% - $10M in one-time savings and over $45M annually – while simultaneously enhancing their security and analytics capabilities by moving to a next-generation Internet Protocol network. This was a massive change fraught with risk, but if you have the data and expertise to select the right partner, the right solution and manage the change, the results one can achieve these days are astounding. Phil: It's been well known in the industry about the legacy relationship you've had with Alsbridge UK and it now appears that you've changed your focus and are making your own investments in UK staff and resources. What's the grand plan for Europe, Chip, and what future investments can we expect? Chip: Our arrangement with Alsbridge PLC, as some are aware, was a brand sharing one, begun in 2005, and there were no cross shareholdings. They have opted to proceed on their own now as Aecus, an 18 person firm focused exclusively on the outsourcing/shared services advisory business in the UK. Perhaps they will continue to operate in this way, or perhaps they will be acquired by another entity. The pseudo franchise model in the UK made sense for us in the past, but it constrained our growth in this important market. We look forward to the opportunity to invest directly and bring our full suite of services and the capabilities of our 250+ strong firm to UK enterprises. Our investments in the UK complement our opening of an office in Germany in late 2013 and represent a step forward in providing European enterprises with an alternative to their current set of advisors. Phil: Why do you see Europe as a core center of our focus when you have such a successful operation in the US? Do you believe the Alsbridge brand and reputation in Europe has real growth potential? Chip: While there are strong players in any one niche, we see Europe as an underserved market. There is no single advisor that can provide clients with a holistic solution and unbiased advice across the gamut of hardware, network, IT services, software and business processes. I believe Alsbridge has a solid brand and reputation in Europe for outsourcing and shared services advisory. But I also believe that European enterprises need something more from their advisors, and that our services can deliver value where there is currently a void. Our focus on and success in delivering value to our clients has served us well in the US market and I believe the same will hold true in Europe. Phil: And finally, Chip, how do you view the advisory industry taking shape in the next couple of years? Which firms will succeed and which could fail? Chip: I wish I had a crystal ball to be able to predict who might win and who might struggle in the coming years. Some of our boutique competitors seem to be stagnant offering the same services at a lower cost rather than enhancing their value proposition, while others shift their focus to selling services to the vendor community or country development agencies. The Big 4 and even some of the traditional management consulting firms are investing in their sourcing advisory practices, but the depth of expertise varies widely among them and historically their interest in and commitment to the space has fluctuated. Growth rates, scale, diversity of offerings, and willingness to adapt the model may be indicators of who can thrive in the rapidly changing advisory landscape. An understanding of emerging technologies, tools for providing data-driven recommendations and the ability to help the client manage organizational change are more important than ever. We have actively worked to add breadth to our service offerings so as to be able to assist our CXO client base from many vantage points and in many ways. Cloud is now ubiquitous with a whole set of new providers; traditional single enterprise data centers will likely be very scarce in less than ten years. Robotic process automation/autonomics is an oncoming, game changing force that will bring a step function change to enterprises and providers. Cognitive networks and the “Internet of Things” offer tantalizing promise and the specter of risk. In the advisory space, if you cannot fluently address this changing landscape for your clients, you will be marginalized, absorbed or otherwise cease to exist. For Alsbridge, it is all about helping our clients Challenge the Future! !